If you are looking for fully fitted steel rims with all-season tyres for your common car, the 123tyres.co.uk store would like to welcome you with open arms. 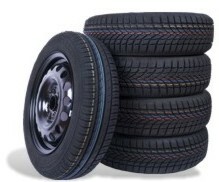 This is where you can expect to find a number of different tyre packages, which include winter tyres, summer tyres, light truck tyres or 4x4 tyres depending on your personal preferences. All of these fully-fitted tyres come with steel rims, which will greatly enhance the look of your car. If you would like to purchase matching rim bands to keep your brand new steel rims protected from scratches, this is also possible right here. Create whatever tyre and rim package will best meet your needs. However, you will need to provide further information about your car so that we can suggest wheels and rims that will fit properly. The large wheels and rims selection offers both premium and budget brands. Dunlop, Michelin, Pirelli, Goodyear, Toyo, Nokian, Bridgestone, Nexen and Nankang are just some of the brands that you might like to consider. Of course, these all-season wheels perform equally well on wet and dry roads in order to keep you safe. Moreover, you can refer to the EU tyre label for further information on each of these tyres as well. Read through the reviews and feel good about your purchasing decision.